Our illustration this month is from Going to Playschool by Sarah Garland. Sarah Garland is interviewed by Julia Eccleshare. We are grateful to Bodley Head and Puffin Books for their help in producing this cover. Well, I can hardly believe the world is waiting for yet another variety of series books, 'perfect for new readers' or not. These two examples of Corgi's addition to a very overcrowded and largely undistinguished market illustrate perfectly the pointlessness of the series when it means a random collection of unrelated, cheaply and drably produced stories of variable quality. 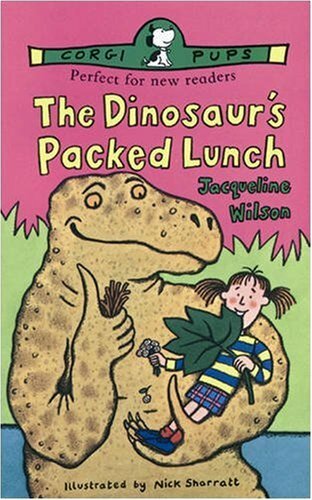 The Dinosaur's Packed Lunch is just silly, Like too many stories for the 'kids' market, the plot is about an unexplained trick (girl turns into dinosaur) which happens for no particular reason and to no particular purpose. A lazy book which invites, in its lack of intelligent thought, comparisons with junk food. 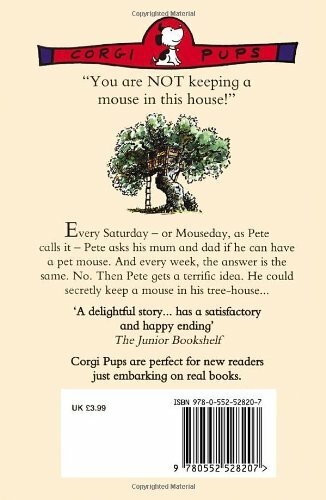 Happy Mouseday does work in a reasonable and well thought out fashion and the story of a little boy's longing for a pet mouse is simply, but convincingly told. It cries out for better quality paper, printing and colour illustrations; for being published in its own right in fact, not bundled together in this wretched format. If a book is worth publishing, publish it properly. If not, don't publish it at all. Fewer mediocre books would mean a better deal for the rest.